Alpha-Zeta Chapter of Sigma Alpha Epsilon at Penn State - THON 2016 is Fast Approaching! 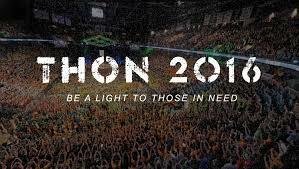 THON 2016 is Fast Approaching! Penn State’s largest philanthropic event is only 45 days away! Join the Dance Marathon Alumni Interest Group. The Dance Marathon Alumni Interest Group (Dance Marathon AIG) keeps its members updated on happenings in the THON community and can offer you more ways to stay involved in THON long after graduation. The mission of Dance Marathon AIG is to promote a continuing relationship between students and alumni who care about THON by providing opportunities for alumni to give time, money, and resources to aid The Four Diamonds Fund in the conquering of childhood cancer. For more information on Dance Marathon AIG, check out their website, www.dmaig.org. Check out your local Penn State alumni group. Many alumni groups are involved in THON in different aspects. By joining your local Penn State alumni group, you could have the opportunity to stay informed on THON events and activities happening specifically in your area. Get involved with an alumni dance marathon. Several alumni dance marathons have been started across the country by THON alumni, and getting involved in them is a great way to continue to stay involved with Penn State and to continue your involvement with THON in the long run. There are alumni dance marathons in Philadelphia, Pittsburgh, New York City, Georgia, Los Angeles, New Jersey, and several other locations across the country. Check back on the THON blog in coming weeks for more detailed explanations of a few of the largest alumni dance marathons! Organize a restaurant benefit night. Talk to a restaurant in your area about hosting a percentage night for THON. Restaurants can donate a percentage of a night’s funds to THON, and it’s an easy way to stay involved! Write dancer mail and kids mail. As THON weekend approaches, get together your chapter of the Alumni Association and assemble mail for THON dancers and Four Diamonds families to help them stay motivated throughout the weekend. Dance for Dance Marathon AIG. You may not know it, but your opportunity to dance in THON isn’t over when you graduate from Penn State. There are actually two alumni dancer pairs in THON every year. The two prospective dancer pairs who raise the most money get to dance in THON, and the third highest fundraising pair gets two full access floor passes. You can find the THON 2014 Alumni Dancer Packet here! Keep up with THON through social media. Make sure to follow Donor and Alumni Relations (@DAR_FTK) and THON (@THON) on Twitter and like Penn State Dance Marathon on Facebook to stay updated on everything happening in the THON community! Also, check back on the Alumni section of the THON blog for more posts about how you as an alum can continue your involvement in the largest student run philanthropy in the world. While many things end when you graduate from Penn State, your involvement in THON doesn’t have to be one of them. THON is a major part of being a Penn Stater, and a great way to stay involved with Penn State long after you graduate.